A separate blog that followed the newspaper accounts of Michigan's "Fighting Fifth" Infantry as it happened 150 years ago has moved to this section of Storytelling + Research = LoiS. Find here the Detroit and other area newspapers originally published by LoiS online at the same pace as relatives did when searching for news of their family in the "Fighting Fifth." Microfilmed reports, unfortunately, are not always clearly reproduced, but this is a way to follow the 5th Regiment since there is currently no book on just this important regiment. Over the five years when the blog was published various methods of coping with those microfilms changed. As a result the quality of reproduction varies and, unfortunately, the original articles were deleted from the flash-drives that captured them off the Library of Michigan microfilm. Sizes also may vary. The largest size possible was used, but you may need to adjust the viewing size to see the best image. As of this date, those original microfilms remain at the library for viewing. Unlike the original blog, I have delayed putting this page up until all material is posted. This permits reading the articles in first to last sequence, unlike the usual blog format which goes from the most recent backwards. Because there is so much material, I am going to break it down by year. This page is when the war started in 1861. It also reveals the learning curve as I worked upon the material. Because the total blog had so many tags to index material, those labels will appear with each article and I can put them at the beginning of each article. They do not appear on the sidebar because the sidebar's tags are for the main part of the blog. Unfortunately some of my original decisions, like the use of this color font, are proving difficult to change. Additionally, quirks of the Blogger process are not truly "WYSIWYG" (What You See Is What You Get), still its price (free, other than my own time) has made problems, for example spacing and fonts different than I chose on the original blog. Yet I have changed it as far as I can, although how it appears may mislead the reader into not realizing there is more to come. Just know that an entire year exists and keep going. The 5th was organized at Fort Wayne, composed of the companies named below recruited mainly at the points designated: Sherlock Guard, Detroit. Mt. Clemens rifle Guard, Mt. Clemens. East Saginaw Volunteers, East Saginaw. Ingersoll Rifles, Owosso. Governor’s Guard, Detroit. Saginaw City Light Infantry, Saginaw City. Livingston Volunteers, Brighton. Washington Guard, St. Clair. Pontiac Volunteers, Pontiac. Huron rangers, Port Huron. It was mustered into service with about 900 officers and men on August 28th 1861. At the time of muster the companies were designated by letter: Sherlock Guard, A.
Saginaw City Light Infantry, K.
Colonel, Henry D. Terry, Detroit. Lieutenant Colonel, Samuel E. Beach, Pontiac. Major, John D. Fairbanks, Detroit. Assistant Surgeon Robert A. Everett, Ann Arbor. Adjutant, William N. Ladue, Detroit. Quartermaster’ Hudson B. Blackman, Howell. Chaplain, D. C. Jacokes, Pontiac. ‘ A. Captain, Edwin T. Sherlock, Detroit. First Lieutenant, John Pulford, Detroit. Second Lieutenant, John W. O’Callahan, Detroit. B. Captain, Judson S. Furrar, Mt. Clemens. First Lieutenant, Edgar H. Shook Mt. Clemens. Second Lieutenant, Henry C. Edgerly, Mt. Clemens. C. Captain, Henry W. Trowbridge, Saginaw. First Lieutenant, William O. Donnell Saginaw. Second Lieutenant, Charles H. Hutchins, Detroit. D. Captain, Joseph A. Eagle, Detroit. First Lieutenant, Salmon S. Mathews, Pontiac. Second Lieutenant, Sylvester D. Cowles, Pontiac. E. Captain, Charles S. Traverse, Port Huron. First Lieutenant, Augustus Zanier Port Huron. Second Lieutenant, Henry F. Decker, Port Huron. ‘ F. Captain, Heber Le Favour, Letroit. First Lieutenant, William N. Ladue Detroit. Second Lieutenant, William T. Johnson, Detroit. G. Captain, George W. Wilson, St. Clair. First Lieutenant, Willis B. Pomeroy, St. Clair. Second Lieutenant, Frederick S. Steele, St. Clair. H. Captain, Louis B. Quackenbush, Owosso. First Lieutenant, William Wakenshaw Owosso. Second Lieutenant, William K. Tillotson, Owosso. I. Captain, John Gilluly, Brighton. First Lieutenant, Hudson B. Blackman, Howell. Second Lieutenant, Charles H. Denison, Brighton. K. Captain Henry Miller, Saginaw. First Lieutenant, Alexander Alberti, East Saginaw. Second Lieutenant, Hugo Wesener, Saginaw. The news of a battle can sometimes take a while to be known and printed. One hundred fifty years ago on July 21, 1861 the First Battle of Bull Run (also called the First Battle of Manassas) was fought. The Fifth Infantry was still in training at Fort Wayne's Camp of Instruction, but news of this first major Union defeat traveled across the wires. Michigan's First, Second, Third, and Fourth Infantry gave the Fifth and also the Sixth and Seventh Regiment extra reason to take their training seriously. Photograph from the main eastern theater of war, First Bull Run, July 1861. 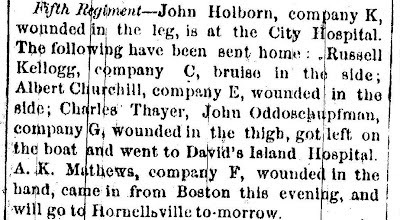 Added to the soldiers, there were hundreds of civilians from Washington, D.C. to picnic and observe what was expected by the North to be an easy victory. The Union troops were composed of volunteers who signed up for 90 days and had little training and experience. 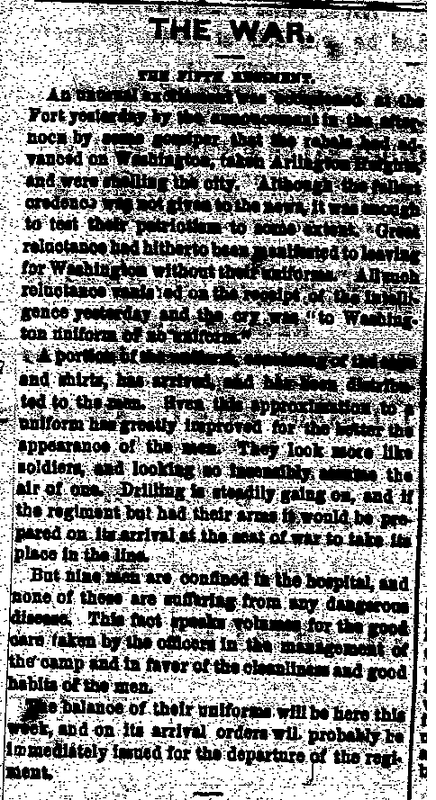 When told to retreat, the way was clogged with the civilians in what newspapers called "The Great Skedaddle." Michigan's own Senator Zachariah Chandler tried to block the way. 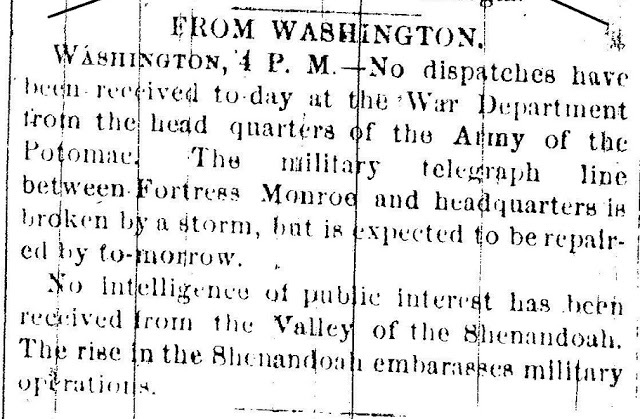 Back in Washington the president and his cabinet received this telegram: "General McDowell’s army in full retreat through Centreville. The day is lost. Save Washington and the remnants of this army." The official Report of Brigadier General Irvin McDowell wasn't published until August 4th of that year. By that time it was recognized that this was not going to be a short, easily won rebellion, but an actual war. When the Second Battle of Bull Run took place thirteen months later, the Fighting Fifth would be there and ready to prevent a repeat of the First Battle. The end of this article was chopped off talking about how experienced, able officers with lives of service to the government are detailed on unimportant assignments. Alas, the joys of microfilm dark spots! There also are these miscellaneous items about individuals. The article continued in the second column, but a stamp (from microfilming?) obscured the remainder of the text. The 5th Michigan Regiment Band still exists! For music clips and more information, go to 5th Michigan Regiment Band . This starts out with a section called Military. I began when the 5th is discussed, after a section about a cavalry unit. This gives the bottom part missing in the previous post. Captain Wilson, Lincoln, Washington D.C. This is a letter dated September 16, 1861 from "one of the Captains of the Fifth Regiment." It was received and published on September 20. At last word from the Fifth in Virginia! Field notes for Munson's Hill, Virginia -- the first engagement. Camp Lyon, Chaplain Jacokes, General Richardson, Virginia, Washington, D.C. Yet another anonymous letter from the field in Virginia. The following brief article was on the same day. The article continues in the next column, but size and clarity is not always adjustable. The Fifth is still in camp. While this was written at Thanksgiving, it took this long to reach Detroit and be published. Correspondent, Ennius, apologizes for the delay in writing. Like many soldiers, he tries to provide a positive view of "The Sunny Side of Camp Life - Breaking Up Camp - An Alarm - Preparation for Winter Quarters - Flag Raising - Health of the Regiment - Medical Staff." At the same time he points to the need for blankets as winter approaches. Ennius closes with "I will try to make my communications briefer and more frequent in the future." As the war finally heats up they will indeed become more frequent. Historic Fort Wayne is where the Fifth Michigan Infantry and many other regiments began. By Christmas of 1861 they were part of the Army of the Potomac away in Camp Michigan near Mount Vernon. There is no newspaper account until January 9 in the Detroit Free Press. For a taste of Christmas of that time, although they were not indoors in Camp Michigan, I want to recommend the page on the Historic Fort Wayne Coalition's website showing their Civil War Christmas celebration. Next on the 1862 page, January 9th, is the posting here of the Free Press article about the Fifth's Christmas. The Fifth mustered in after the disaster at 1st Bull Run and Lincoln didn't issue his first special war orders until Jan. 31 of '62, asking the Army of the Potomac to move "before, or on, the 22nd day of February." Their action built gradually, but definitely.